It's mid-winter and I am ready for some heat. So I was thrilled to get my hands on some authentic New Mexican green chiles from The Hatch Chile Store. Chiles aren't in season right now, but these are roasted, peeled and then flash frozen so with a quick defrost in cool water, I had fresh and flavorful hatch green chiles in no time. 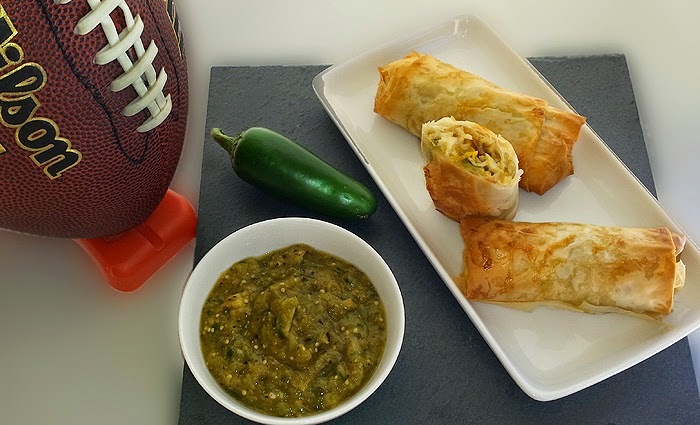 The biggest football game of the year is almost here giving me the perfect reason to try a new appetizer featuring the green chiles. The Green Chile Chicken Rolls below were much easier to prepare than I had initially planned and my taste testers enjoyed them much more than I anticipated. I served them with a tomatillo sauce but they are quite delicious on their own. Whether your favorite team wins or loses these stuffed chicken rolls are sure to be a score with your guests! Prepare the phyllo dough according to package directions. Preheat the oven to 400 degrees. In a bowl, mix the chicken, cheese and green chiles and set aside. Lay the prepared phyllo sheet down on a large cutting board. Lightly brush with olive oil. Repeat process with a second sheet. The oil makes the dough easier to work with. Be gentle as the phyllo is quite temperamental. Cut the phyllo lengthwise in half so that you have 2 evenly sized rectangles of dough. Spoon a heaping tablespoon towards the end of one of your phyllo rectangles. Fold over twice and then tuck in each side to seal the roll, using oil to make the dough more pliable and agreeable. Brush the top with some more oil and the egg wash if using. Place on a foil lined cookie sheet and bake for 15 minutes. I can almost here the crunch of these just by looking at them. Love your choice of filling too! Gosh you are speaking my language! I would have these green chile chicken rolls for breakfast. I girl can wish! I adore using phyllo for quick appetizer and meals. These rolls are so creative and would be fantastic for game day or dinner! Love how simple and tasty this looks! Oh yum - this is definitely going on our Super Bowl party menu! Hatch green chiles are my favorite! They look perfect for the super bowl! I look forward to Hatch chili season every year. These chicken role would be perfect for a Super Bowl party! Hatch chiles are a faaaavorite of mine. I got some whole hatch chiles from The Hatch Chile Store last year. Love how you use them here. I love these! So much great flavor with just a few ingredients. And the the phyllo dough makes for such a crispy roll! Delicious idea! These might need to make an appearance asap! Using the phyllo dough is a brilliant idea. I love how crunchy it gets when it cooks and the flavor is awesome. your rolls look absolutely delicious. These looks so good and so easy! Oh YEAH! My husband would love these! Great idea! Oh, I can just imagine crunching through that phyllo into the savory filling. These sound delicious! Oh wow those look delicious! Oh my...I haven't had hatch since I moved from Colorado. Sounds so good! You're right! These are totally perfect for football...yum! This recipe looks amazing. I love green chilies. Oooh yum...I miss phyllo dough! Sounds so good.